At the risk of getting too personal, I need to disclose: I’ve had laser hair removal. One of the best choices I ever made. No more annoying, time-consuming daily shaving. 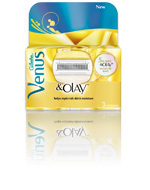 No more barbaric and inconvenient waxing. Just…WAY less body hair. That’s not to say that it doesn’t still grow somewhat. Much less than before, but I do still need to address that grooming issue every few days. Shaving seems to take care of the problem with little or no trouble. Since the LHR I hadn’t given much thought to the brand of razor I use. Honestly, they all seemed to do the job much the same so it didn’t seem to matter. Until now. 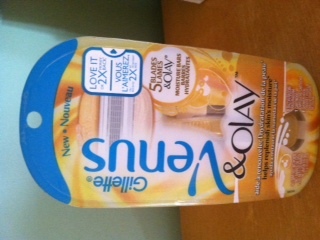 And the new Gillette Venus & Olay razor. First impression: the shaving head seemed a little big, so I thought it might be a little cumbersome. Second impression: I tried it and thought “Well, this thing doesn’t work – it doesn’t even have a blade on it!” It’s that smooth. Seriously, I didn’t even feel the razor going over my skin, just felt the buffer gliding along. But it does work, and work well. I’m sold – this is now the only razor I will use. Problem is, I haven’t yet been able to find the replacement blades…hurry up Gillette! 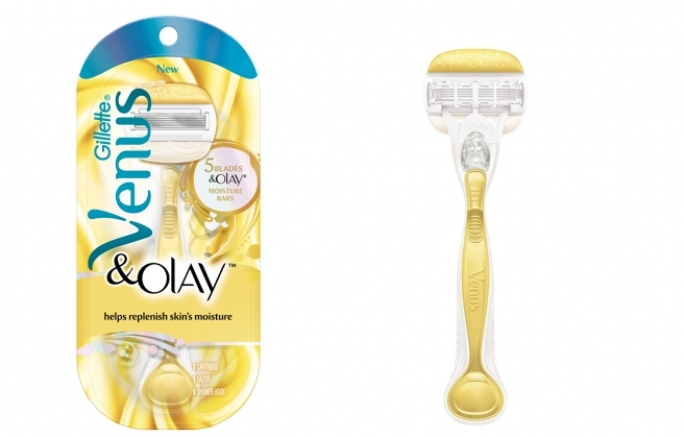 The details: 5 blades, moisture bars with Olay softening, pivoting head and easy to grip handle. The razor handle with 1 blade retails for $8.99 – $10.99. A package of 3 replacement cartridges is $14.99 – $19.49. Totally portable and makes quick work of any strays you forgot to take care of before leaving home.